October 1917 – Workers in Power. 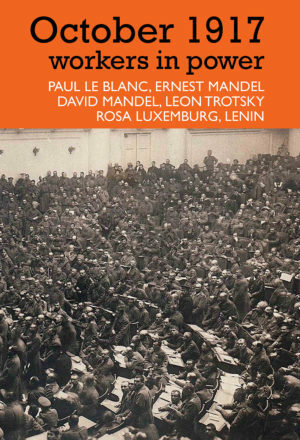 Paul Le Blanc, Ernest Mandel, David Mandel, François Vercammen, and contemporary texts by Rosa Luxemburg, Lenin, Leon Trotsky. January 26, 2017 –– Links International Journal of Socialist Renewal reposted from International Viewpoint –– Nearly a century ago, the workers and peasants of Russia overthrew the Provisional Government and established the world’s first socialist republic. It was a seminal moment in human history. For the capitalists of the world, it was an event to be feared and they marshaled their forces to contain Bolshevism. For the workers of the world, the Russian Revolution was an inspiration to take the socialist road. Now, as we approach the Russian Revolution’s centenary, its influence appears buried beneath not only the onslaught of anticommunist propaganda, but from the salvos of Stalin’s counterrevolution which crushed so many hopes. Yet the world still needs the alternative which the Bolshevik Revolution represents – working class democracy, socialism, and internationalism. October 1917 – Workers in Power does a magnificent job with its scholarly, primary sources, bibliography, time-line and a glossary to help for those curious about socialism and seasoned activists to reassess and redeem the meaning of the Bolshevik Revolution. The opening chapter by Paul Le Blanc provides a historiographical overview of the mountain of works on the Russian Revolution. Le Blanc discusses the different interpretations of the revolution from sympathizers such as John Reed and Leon Trotsky to hostile accounts like Richard Pipes and Orlando Figes and reivisionists such as Sheila Fitzpatrick and J. Arch Getty. Le Blanc is not an unthinking partisan of the Revolution, but carefully distinguishes between scholars who challenge the Cold War mythology of either the capitalist west or from the USSR who claim a basic continuity of Bolshevism from Lenin and Stalin. For those who want to immerse themselves in the vast literature on the Russian Revolution, Le Blanc’s essay contains not only a wonderful bibliography, but raises thoughtful questions on many issues ranging from nationalism, women’s oppression, political power and the nature of working class consciousness. It alone is worth the price of the book. The heart of October 1917 is found in three essays by Ernest Mandel and David Mandel (no relation). Ernest Mandel was a longtime Trotskyist activist, historian and economist. Ernest Mandel’s "Coup d’etat or social revolution" tackles one of the most propagated myths of the Russian Revolution – that it was a coup led by an elitist group of ideological fanatics who instituted a totalitarian system from day one. Mandel’s account demolishes this myth by showing that the revolution did not interrupt a gradual modernization and democratization of Russia, but that the Tsarist Empire was unreformable and revolution offered the only way out. The other political groups, whether Mensheviks or Socialist-Revolutionaries were willing to compromise their vaunted democratic and socialist principles rather than see them through to the end, while the Bolsheviks championed and put those principles into practice. Mandel explains how the Bolshevik government expanded democracy for workers, granted land to peasants and put internationalism into action. However, Mandel is not blind to criticism of the revolution and details how the civil war brutalized society and led to the end of democracy in both the party and state (a process that Lenin and Trotsky contributed to). Mandel believes that in time 1917 will be rescued from those who see it as a destructive waste, and once again viewed as a liberating event capable of inspiring workers and radicals. The two essays by David Mandel (a long time Soviet-studies scholar) explore the history of the Russian Revolution “from below.” In the first, "Economic power and factory committees in the Russian Revolution", Mandel focuses on the factory committees and their demands for workers’ control in the capital of Petrograd during the turbulent days of the revolution. Mandel shows that the workers’ control movement was not utopian or anarchist, but dominated by the Bolsheviks, who understood the importance of both political power and coordinating production. Russian workers did not begin their struggles in 1917 demanding socialism, but wanted some form of control or supervision over production. However, the resistance by the bourgeoisie and the general breakdown of production caused the workers to move beyond simply demanding supervision to advocating nationalization and expropriation of the capitalists. Mandel shows the shifting attitudes of Lenin and the Bolshevik Party to these developments. The party recognized that Russia was not ripe for socialism and kept their own slogans of workers’ control necessarily vague. However, the economic crisis and capitalist resistance meant that demands for workers’ control coincided with the slogan of “all power to the soviets.” And more than any other party, it was the Bolsheviks who were able to provide a realistic alternative for the workers. In the second essay, "The legitimacy of the October Revolution", Mandel defends the legitimacy of the Russian Revolution as an anti-capitalist revolution with massive popular support. Mandel says that there was no meaningful democracy in Russia before October, since the ruling classes feared it and refused to satisfy the aspirations of the people. He praises the Bolsheviks for not only championing the demands of workers and peasants, but for daring to take power to transform society. True the revolution degenerated, but Mandel states this was due to the material conditions of an isolated revolution in a devastated country and not something written into the ideology of Bolshevism or socialism. The remainder of the collection is rounded out with texts by first-hand participants and supporters of the Bolshevik Revolution such as Lenin, Trotsky and Luxemburg. These accounts show what the revolution meant to those who took part in it and what they believed it meant for the rest of the world – an end to exploitation and oppression. For me, the Trotsky’s 1932 lecture, "In Defense of October" is not only a concise explanation of the causes of the revolution, but a spirited defense of its achievements. Trotsky’s essay is an excellent introductory text on the Russian Revolution (and his masterpiece The History of the Russian Revolution) and worth revisiting just for its sheer literary brilliance.